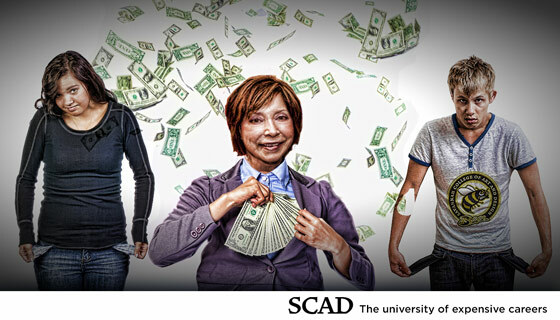 Starting next school year (2013-2014), SCAD will raise its students’ cost of attending by 14-20%. Exceeding national inflation by a large multiple, the spike in student costs will occur through a subtle mix of hidden fees, contractual obligations for freshmen, and mandatory requirements for purchasing services and course materials from SCAD. The scheme for increased profitability was, in part, conceived by the Mad Turk as a last gesture before his recent and yet to be announced firing from the SCAD administration. SCAD’s 2011 IRS 990 form shows a healthy 30 million dollar profit . Celebrated for her financial acumen, SCAD’s Dear Leader knows that the SCAD community can, and will do more, for profits in future fiscal years. The new revenue stream was the brainchild of the Mad Turk as a parting gift to the College. “Following the model of American healthcare, legal services, and military consulting industries, SCAD will now be optimizing [marking-up] everything that our customers need,” explains Hyacinth Bucket, SCAD’s Director of Public Relations. Bucket continues on background that students will be nickeled and dime’d so slowly that they will hardly notice the increase in their indebtedness. We at SCAD Secrets are fully supportive of these market-driven tactics to increase shareholder value. A small increase in the tuition, small enough not to raise alarms, but large enough ensure that the collected Federal dollars continue to roll into SCAD coffers. Key to the SCADinvestorvalue 2020 Plan is a significant hike in food and housing costs. Freshmen will be required to live on campus in SCAD housing, to enroll in SCAD food services, and to pay fees for travel in SCAD-chauffeured buses. For this convenience, students will see SCAD housing and dining costs increase significantly. Currently SCAD housing is priced at twice the level of housing off-campus. SCAD food service costs are roughly one third above the costs of local private sector options. The 2020 Plan also requires students to purchase all art supplies and prints from the SCAD student store. Too much competition leads to dwindling revenues for SCAD administration perks, so the simple solution will be to eliminate all competition for SCAD student dollars. No more “Image is Everything” for student printing, good-bye ‘Creative Approach’…. You will no longer be seeing SCAD students waiting in line for last-minute printouts. SCAD will start to play hardball with local, alumni-owned businesses. It’s on-campus printing and supplies or nothing at all. In the works: a contractual agreement for all incoming freshmen to complete their first year at SCAD or forfeit scholarship money used to entice them to the school. In other words, once you start at SCAD, you will not be able to transfer out—without a significant payback. Cost-Cutting and Two-Quarter Contracts: Fall 2013 Faculty Contract Preview Will SCAD Close Hong Kong 2015? Accused Buying & Selling Credentials?